Amazon, eBay and Alibaba.com were the top three destinations for online shoppers around the world during the month of June, according to a recent survey. The three sites together accounted for 50 percent of traffic to online retail sites during that month, reports researcher Companiesandmarkets.com. Amazon was the top destination among shoppers. It received 20 percent of online retail traffic with 280 million visits to the site. eBay was the second most popular destination, earning 16 percent of retail traffic. Alibaba.com came in third, getting 14 percent of retail traffic. 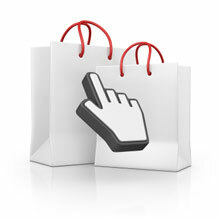 Altogether, about 650 million shoppers visited the three sites in June, Companiesandmarkets.com reports. "The online retail space is highly competitive and although there is a large volume of players, it is interesting that the top three players account for such a high volume of visitor numbers," Companiesandmarkets.com note. "[It's] a reflection of the dominance of the larger online retail aggregators in the market." The study also found that Wal-Mart ranked sixth, and recently surpassed Sony and Amazon as a top destination for movies for buyers in the U.S.
eBay says bill will burden small-business owners. 'Considerable opportunities' seen for sellers who export. Technology enables product recommendations and purchase restrictions. An estimated 200 sellers surpass the $1 million mark.